After the Sixers' 111-102 loss to the Nets in Game 1 of their first-round series, it's time for Game 2 (8 p.m./NBCSP). Joel Embiid is questionable, but with the team down 1-0, I'd be surprised if the All-Star center doesn't go. Expect Embiid and Jimmy Butler to be the focal points for the Sixers offensively. Hopefully, Embiid will feel a little better and be able to dominate on the low block like he did early Game 1. Obviously, the Sixers need way more out of JJ Redick, Tobias Harris and Ben Simmons (I've listed them in order of concern level). Redick's shortcomings are apparent and known, but he's a veteran that can light it up at any point. Harris had a brutal end to the season, but I still think he can produce once he gets out of his own way. Simmons is the guy with the most troubling pattern. He's still just 22 and trying to lead a team with lofty expectations. The Nets packed the paint and it clearly threw Simmons off in Game 1. I see Simmons bouncing back. Brooklyn doesn't have the horses to keep him under wraps. He had a few good looks early, but seemed to get discouraged after they didn't fall. Lost in a discouraging loss, the Sixers weren't terrible defensively. The Nets shot 43 percent from the field. The dangerous trio of D'Angelo Russell, Spencer Dinwiddie and Caris LeVert combined to shoot 24 of 57 (42 percent). That's encouraging. The Sixers won't shoot 3 of 25 from three and will get better performances out of their starters. They come into this one with something to prove and will head to Brooklyn with the series tied. The Sixers' problems with pick-and-roll defense, their bench being outplayed, and their lack of a true offensive identity are concerns not exclusive to Game 1. However, Ben Simmons, Tobias Harris and JJ Redick all having poor games on the same day and the team shooting terribly from three-point range (3 for 25) are, in all likelihood, outliers. I don't expect either of those things to happen today. I think taking an early lead will be especially important in Game 2. The Sixers need to brush off the gloomy, dejected vibes of Game 1 and prove they're not only the more talented team in this series, but that they're capable of playing as a cohesive unit. 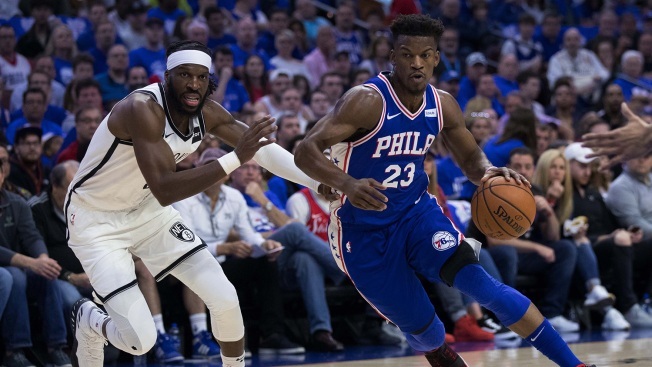 Brett Brown's adjustments will matter, and there are plenty of possibilities on the table - Will he play Jimmy Butler more at the point and Simmons more in the post? Does he stick with Jonathon Simmons as his primary backup wing? Will the Sixers make any changes to their pick-and-roll coverage? Yet it feels like this game could hinge more on the Sixers' desperation and desire than anything else. The Sixers don't need this game, but it should matter a lot more to them than it does to the Nets. I think they'll play with more sustained energy, identify a few things that work outside of Butler pick-and-rolls offensively, and even the series.